Eating is always fun but wouldn’t the experience become a whole lot better if you were at a different place altogether? Well, these five themed restaurants offer an experience that is as great as the food they serve. Check them out. If you love themes or can't afford a trip to Rajasthan anytime soon, Choki Dhani is the closest experience you'll get while you're in Pune. Cultural dancing, the ambience, eating style and everything in between will make you feel like royalty. Try their veg thali with daal baati churma and you'll surely have a fulfilling experience. Want to experience Old Britain? This is the place to be. Themed around old London with a red telephone booth, red trams and the classic double-decker bus, you'll feel like you're in the big ol' U.K. And, while you're feeling like you're in Britain, you've obviously got to try fish and chips with a pint of beer. Want to visit a forest, but without the hassle of being outdoors? 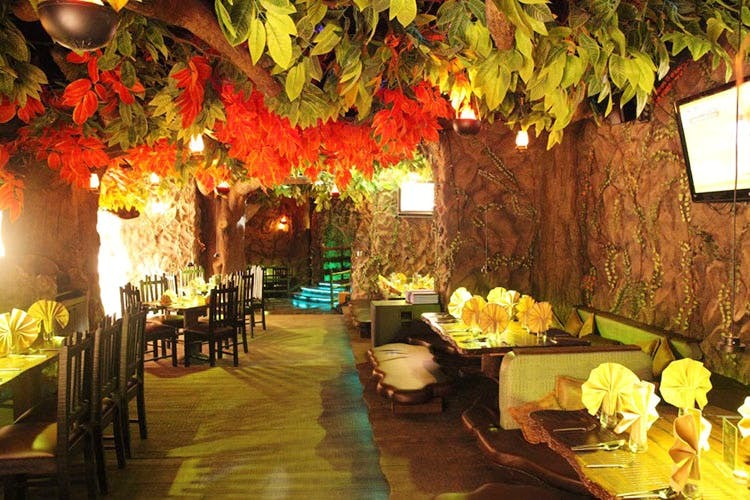 Dine at the Rainforest Resto-Bar, which is designed to look like a dense rainforest. It's a very colourful place you'll love the Singaporean chilly crab, and don’t leave without the Bailey’s delight . This unique restaurant will give you the complete experience with their ambience and sounds of the jungle. As the name suggests, this restaurant is built to give you a feel of a village. With trucks, camels, a police thana and even a mehendi artist and palmist, this is not a place to miss out on. So, get your hands messy eating the traditional way at a buffet. You'll get a lot of Indian food, complete with loads of mithai for dessert. Drive down to one of the most happening places in Pune and you will be transported to Greece. Their greek based menu offers you veg mezethes and lathovrekto. If you're not afraid to try new cuisines, you won't be disappointed. The bar also hosts gigs and has yummy cocktails.